I grew up shopping at Banana Republic; as one of my mom&apos;s favorite brands, it became my go-to for just about every occasion. That sharp blazer I wore to my college interview? Banana Republic. The simple but elegant brown dress I wore to my grandfather&apos;s wedding? Yep, that too. But in the past few years, and especially after I began working in a field in which there is no real dress code, I found myself coming up increasingly empty-handed from my trips to the store I once frequented. Even my brand-loyal mom was having a hard time finding pieces she wanted to pick up. That&apos;s something that the brand&apos;s creative director Marissa Webb has been aware of since taking over in April — but she&apos;s not discouraged. "It&apos;s amazing how many people have said, &apos;Oh I haven&apos;t been shopping Banana recently, but I really love Banana Republic and I want it to be a great success,&apos;" she tells Fashionista. "The people rooting for the brand, that&apos;s amazing." 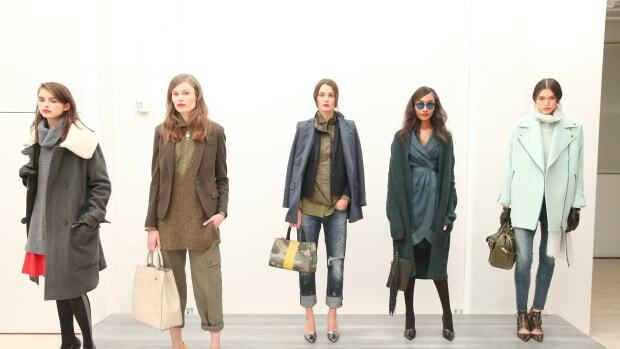 Banana Republic tapped the designer, who launched her own line last spring after leaving J.Crew, to help overhaul the brand earlier this year. Webb, in her cool blue shorts suit and vertiginous black pumps, is the perfect ambassador for her own vision for the brand. "The Banana Republic customer is like my father, who took me there as a little kid, but there is a younger customer who wasn&apos;t finding the playfulness," she says. "We became a little bit too serious." That&apos;s already begun to change under Webb, who has been tweaking the brand&apos;s styling and revamped its Fifth Avenue store in New York with unique touches like handwritten notes on chalkboard walls. The summer 2015 collection, which debuted Monday morning, is the first that was created completely under her direction, and it shows: Crisp whites are punctuated with cool black leather pieces; big floral patterns and perfectly fitted separates were all given the kind of effortless styling we&apos;ve come to expect from the designer. Webb used the brand&apos;s signature safari colors as a starting off point, but wasn&apos;t afraid to stray from the neutral palate. "We&apos;ve added a lot of new colors for Banana Republic, but it&apos;s not the rainbow," she explains. "We&apos;ve been very selective about that as well. We started with a blank canvas, really wanting this collection to be an indication of Banana Republic going forward." In this sense, Webb isn&apos;t so much navigating uncharted waters as she is adding wind to Banana Republic&apos;s sail — her presence gives the brand some much needed direction without steering the ship off course. And don&apos;t let the styling fool you (hello, perfect orange-red matte lip) — this isn&apos;t J.Crew 2.0. While these are definitely more stylish, elevated offerings from Banana Republic, they won&apos;t scare the brand&apos;s loyal customers away either. I spotted as many pieces that would fit into my mom&apos;s wardrobe as would fit into my own. Gap Inc. will also invest in her namesake label.